While searching for references on Cherry Creek jasper, I was surprised to see Eckhert listing fine jasper occurring in Cherry Creek in Gila County Arizona. I was quite sure what is sold as "Cherry Creek" came from China. Oh dear, another case of "everything you know is wrong?" Probably not. Polk shows a photo of "Cherry Creek" that came from China. On-line references say it comes from mainland China, with other names including Red Creek and Picasso jasper. We have seen Picasso jasper for a long time, normally the colors are dark grey, caramel and cream, and thus it is ideal for animal carvings among other things. The very colorful Cherry Creek hasn't been around as long but you can see the family resemblance in larger pieces. But that does leave us wondering what the fine jasper from Gila County looks like. I might go look for it some day and maybe have the great good fortune to see a Gila monster while I'm out there! 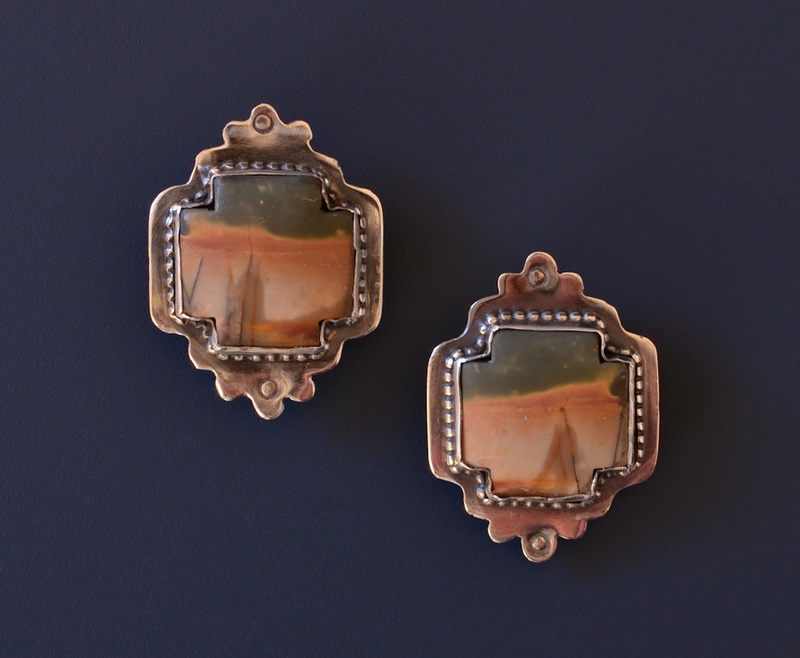 The shape of the stones suggests the Native American understanding of the four directions, particularly because of the tipi images in them and the matte finish which makes them look soft, almost like buckskin. Castaneda gave us a fascinating discussion of the winds associated with the four directions in The Second Ring of Power. He contends that every woman has her own wind from one of the four directions. Of course the consensus is that his books are novels, there is nothing real about them. That is something one has to decide for oneself by testing what he says. So if you are a woman, have you discovered which wind is yours? I wonder if these earrings would help remind you to study the question by paying attention to the wind. Does it sound interesting? 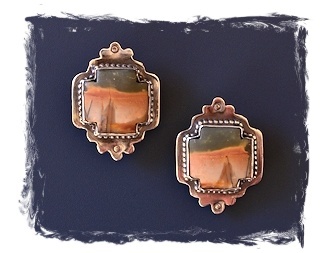 If not, no matter, you may still like the earrings!